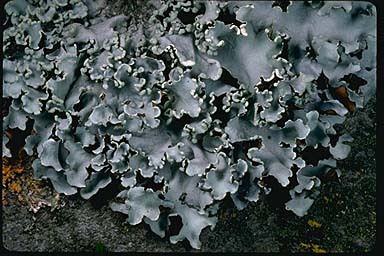 "Powdered ruffle lichen" (Parmotrema chinense) on toyon bark, Santa Cruz Island, off of the coast of southern California. This lichen is used medicinally in India as a poultice to induce copious urination, as a linament and an incense for headaches, and also as a powder to help wounds heal. Taken internally, it has a variety of properties to treat many ailments.